Turn your multi-tool into an efficient caulking cutter & sealant remover. 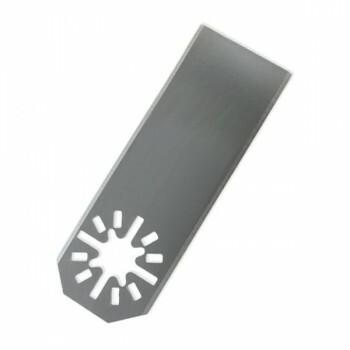 This rectangular cutter features a straight sharp edge on both sides for joint silicone removal. Ideal for separation of caulking bonded materials. This tool may be your most efficient way to remove old filler caulking. The flat & straight profile of this cutter is ideal for plunge removal and separation of block expansion caulking gaps. The M057 Flat stock Rectangular Sealant Cutter is excellent for broad plunging removal of silicone caulking or soft adhesives. Use this sealant cutter for clearing out sealant joints. Ideal for separation of block forms bonded by silicone or other caulking materials.